In recent years, there has been an upswing in commercially successful documentaries as well as increased visibility for documentaries with overtly political messages. Along with these two trends, there has been more public attention to the political potential of documentary films from Fahrenheit 911 to March of the Penguins. Reflect on the place of documentary in the present American political climate. Tempting as it may be to single out the importance of our own times, it is imprudent to contemplate the commercial success of “documentary now” in relationship to the American political climate without looking at the political roles of “documentary then.” Unarguably, there are more overtly political documentaries being made and made available in 2007 than at any previous time. There are also more books, magazines, fiction films and television, more news coverage, websites, blogs, more of everything and everybody discussing political and social issues. Proportionally then, are documentaries more vital and more influential in our time than in others? 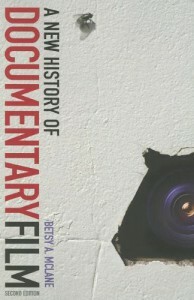 Possibly the form has reached a peak, but documentaries must still be considered within the continuum of history. Similar examples abound in most decades. In 1930 the Film and Photo League was established in New York to produce media that would present the “true picture” of American life, in this case, a picture based on a Marxist point of view. Films like BONUS MARCH and HUNGER (both 1932) were strident calls for reform. The federal government itself sponsored Pare Lorentz’s magisterial THE PLOW THAT BROKE THE PLAINS (1936) and THE RIVER (1937), both shown extensively in commercial theatres. In its day PLOW’s depiction of dustbowl suffering was as affective as present day documentaries of Hurricane Katrina catastrophes. The key role of political documentaries in WWII is indisputable. It was in theatrical documentaries that the American public saw and rallied behind this war. The form’s importance was such that it even moved The Academy of Motion Picture Arts and Sciences to award the first documentary Oscar to THE TRUE GLORY (1945, Garson Kanin and Carol Reed). The 1950s saw the rise of brilliant era of television documentary, the power of which perhaps culminated in the outcry following the broadcast by this CBS of HARVEST OF SHAME on Thanksgiving Day in 1960. Its depiction of the wretched conditions and the hunger of migrant workers drew outrage from people and the press across the nation, adding to the social conscience that was ultimately manifested in Lyndon Johnson’s Great Society “War on Poverty.” Even as television’s golden age of investigative documentaries drew to an end, THE SELLING OF THE PENTAGON (1971, Peter Davis) provoked a Congressional committee to investigate the fairness of that film’s expose of the military-industrial complex. The size of the audience for the CBS special was, in the era of three major broadcast networks, far larger than any television channel can deliver today. The number of young people inspired to take on a radical new life style after seeing Warner Brothers’ release of WOODSTOCK (1970, Michael Wadleigh) is uncountable. For over 20 years it remained the highest grossing theatrical documentary film of all time. Opposite this corporate appropriation of “youthquake” rose the 16mm work of highly politicized filmmakers like the Newsreel Collectives. Shown widely during an era when college campus screenings provided a chief alternative to Hollywood releases, these documentaries helped to spread the politics student revolt, Black power, and especially the anti-Vietnam War movement. Following quickly were significant documentaries that emboldened the feminist and gay rights movements. Although there was little access to Hollywood distribution for this work, there was a large and profitable 16mm business that brought thousands of political documentaries to schools, community groups, libraries, film societies, art houses and even prisons. It was not until the late 1980s and the 1990s that the exponential proliferation of cable channels and the displacement of film by video and nonlinear editing took on most of this role and begat the present tide of political documentaries. The tools of film were suddenly available to thousands of makers. These same technologies also increased the swell of fiction works. If the documentary enjoys increased visibility today it does so in a climate in which “celebrities” big and small, along with merchandized product brands, best-selling novels, highly-paid athletes (and their namesake shoes) enjoy similar increased visibility. What is different about documentary is the sense of participation, even ownership that the public now feels for particular films that speak to issues of importance to them. Passionate filmmakers have always used grass-roots distribution and exhibition methods to find their audiences. The process now is far more effective because of the ease of reaching that audience. Discourse around any topic can develop very rapidly as people see documentaries via on-demand video, low-cost (or free) DVDs, and still in theatres. Online communities are created around documentaries and their issues almost instantly. It may be hard to create a devoted national community around an online brand for a telephone service; it is much easier to rally an online audience around a dramatic social cause. The way moving image media are now used also creates an intimacy between subject and audience that documentarians can exploit. Because audiences are familiar with the aesthetics used in current documentary filmmaking, (and often employ the same styles in their personal “home movie” videos), and because audiences often ascribe validity to real life images, documentaries can carry great weight. Because thousands of people now have access to documentary making and distribution media, there can be a public discourse in a way that before was possible only in print or in person. Documentary engages people, as does no other form. Even blogs require more effort to assimilate. But as it becomes the “lingua franca” of American democracy, documentary does not, nor never has stood apart from its own fascinating history, nor apart from the apparatus us all media. A final thought: Edison’s 1900 catalogues announced at least three documentaries, all made in 1898. Troop Ships for the Philippine Islands — including California volunteers heading off to occupy and quell the Philippino resistance.